with a subcription to the eQuilt2day Club. Based in Denver, CO, Jennifer Rapacki is a tech-savvy fabric artisan specializing in combining traditional quilting techniques with technology driven designs and inkjet printing on fabric. Jennifer teaches classes in Photoshop Elements for Quilters, Electric Quilt, FraxHD (a fractal iPad app), Fabric Weaving, Tatting, and Peekaboo fabric a new twist on reverse applique. In her lecture, Creativity Unleashed: Modern Technology for Quilters, she presents many of the possibilities when using a computer as a design tool for quilts along with some samples of her more traditional techniques -- fabric weaving and reverse applique. The Sea Turtle & Cactus are available as a kit for class, $30. "Creativity Unleashed: Modern Technology for Quilters"
Just what can you do with Modern Technology in quiltmaking? In the lecture Jennifer shares her experiences and designs using Adobe Photoshop Elements, Frax HD, (a fractal app for the iPad), and Electric Quilt along with inkjet printing on fabric. Many samples of quilts will be shown along with a few quilts created with more traditional techniques. The lecture is a powerpoint presentation / trunk show format. "I was a little worried that Jennifer's topic may be too technical for our guild members. Boy was I wrong! She is a great speaker and her slide show + trunk show was really engaging and fun. Everyone in the audience stayed interested and asked tons of questions, especially when she started showing how she created images and transferred designs to fabric on her home printer or by using services such as Spoonflower. I think we all saw the possibilities for incorporating a lot of new ideas into our quilting. I would highly recommend Jennifer to any Guild looking for a speaker who can open new creative doors for their members." A followup lecture featuring Jennifer's newest quilts for quilt guilds wanting a return visit. "DIY Inkjet Printing on Fabric"
Everything you should know about inkjet printing on fabric either at home or online: Dye vs Pigment Printers, Prepared fabric sheets, fabric softener rinse, print on demand services, and more. "Ancient Inspiration for Patchwork Patterns"
Travel back in time to see examples of quilt patterns going back to the middle ages along with information about the evolution of quilt making over the years. Flying Geese, Sawtooth, Birds in the air are just a few of today’s quilt blocks that can be seen in ancient mosaics and architecture. 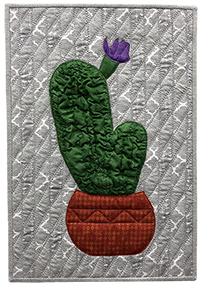 Increase your quilting creative potential! Take your design process to a new level by learning the EQ Quilt Design software. Hands-on class, laptop required. 1/2 day & 1 day options. 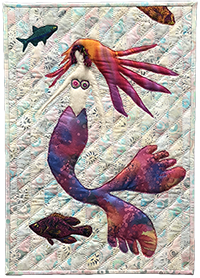 Memory Quilts, Art Quilts and more….Learn how to edit, enhance and prepare photos/graphics for inkjet printing on fabric. Also learn to make a customized background that looks pieced but is not (see Pixel Pizzazz 1 - Poppies quilt) Hands-on class, laptop required. 1/2 day & 1 day options. 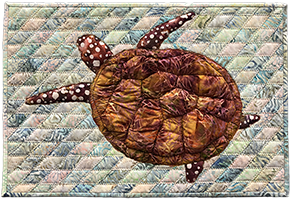 Sample Photoshop Elements and Electric Quilt to see how the software can fit into your quilting toolbox. In class you will be introduced to the basic tools of the software programs by learning about editing, sizing and printing photos in Elements and about the workspaces in EQ8 by creating a quilt. Trial software available. Hands-on class, laptop required. Learn how you can print your own fabric at home or yardage at print-on-demand services like ModernYardage, Spoonflower or Fabric on Demand. Topics include file types, sizing images for print and show submissions, labels, color. Hands-on class, laptop required. 1/2 day & 1 day options. NOTE: Students can "try before they buy" with trial versions of Photoshop Elements and Electric Quilt. Students can also use a PC or a MAC. Grab a charm pack from your stash and learn how to make reverse applique leaf shapes with really sharp points and smooth curved edges -- no curved piecing required. The technique is a quilting adaptation of a couture Spanish Snap buttonhole resulting in Peekaboo fabric -- A new twist on reverse applique! The class project can be a Table Runner, Mini Quilt or Mug Rug. 1/2 day & 1 day options. Click here for more info and samples. Create a unique textured background for a small wall quilt by weaving 1” strips of raw edge fabric on the diagonal. No piecing required, thus no Y seams. 1/2 day or 1 day options. Click here for more info and samples. Jazz up that purse, iron tote, bag, quilt, shirt (the list can go on and on) with custom-made woven fabric. It's surprisingly easy to do and worth the effort. Students will learn how to weave 1” wide strips of raw edge fabric to create a whole new unique piece of fabric that will be used to make a zippered pouch. Thread Embellishment adds the final pizzazz. 1 day. Click here for more info and samples. Embellish that quilt with Tatting. Learn how to make rings with a shuttle (plus picots and chains if time permits) for use as leaves, flower centers and more.. 1 day. Click here for more info and samples. Lecture: $425 or $395 when scheduled with a workshop. Each additional student over 20 is an extra $25. Half day workshop fees available upon request. If you would like to discuss having Jennifer lecture at your guild meeting and/or schedule a workshop, click here to contact her now. Can't make it to one of the classes or don't live in Southern California? Jennifer can provide one-on-one training via the internet if you have a high speed internet connection. Contact her for more information and fees. Copyright © 2000-2019 [Jennifer Rapacki]. All rights reserved.